Nyd en af ​​de bedste vandreture i Italien med denne vandretur langs gudernes vej fra Sorrento. Tag den utrolige udsigt over Amalfikysten, når du vandrer langs klipperne. Deltag i en vidende guide til en 3,5-timers vandretur midt i en 6-timers udflugt. Nyd en rundtur fra Sorrento. Antonio was a first rate. Excellent knowledge of the path, the plants in the area, and always concerned for our safety. The hike was wonderful. I'm in OK shape for late 50's and it was not a problem. Other people on the trail struggled a bit and had to go slowly, but they made it through OK. Going down the stairs from Nocelle to Positano at the end left my thighs sore the next dayb but otherwise I did not find it too strenuous. I've hiked in a few locations in the western US, and this would be classified as a moderately difficult hike on the easy/moderate/challenging scale. Highly recommended! 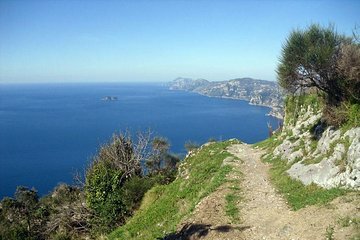 This was a more difficult hike than we anticipated which was a good thing as we we were due some decent exercise after cruising around the Mediterranean for a couple of weeks prior. Our guide kept a healthy pace up and some of the less fit members of the group struggled to keep up, but he would always wait at regular intervals and made sure everyone in our small group of 10 were ok and got to hear all the information he had to impart regarding the various views and areas we saw along the way. The views really are beautiful and our guide was a true professional. He organized our hike so we wouldn't be constantly passing or seeing other noisy groups. I would totally recommend this tour, make sure you wear good hiking shoes and be prepared for about 4 hours of some heavy duty walking including some steep inclines and rugged trails. Great experience and Nino was a wonderful guide. He stopped for wonderful photo ops and provided education re: vegetation and life as it was in the past along Path of the Gods. The only reason I gave 4 stars is because the pace was quite brisk for some - the rocks can be slippery with the stones on top, and it's a long way to the bottom. Wear sturdy shoes, bring water, and a hat. Well worth it! Thanks for a wonderful time. Firstly a word about the guide. Neno was an excellent guide who was passionate about what he did. Bearing in mind he does this day after day, we found him very knowledgable and enthusiastic. As for the walk we agree with other reviews, it is not for the faint hearted. I am in my late 60s but walk regularly in the UK and consider myself to be at least of average fitness yet I found this walk quite exhausting. The excursion starts from Nocella and that makes the path considerably harder than starting from Bomerano. Most self guided walkers walk in the other direction from Bomerano but it is either very expensive or very difficult to get to Bomerano so we opted for this excursion. On our walk in early Sept it was 26 deg and full sun with a lot of humidity officially felt like 32 deg and I found that coping with the heat was the biggest problem. After two of the group of eight dropped out I became the slowest because of the heat. Neno regularly stopped so that I could catch up but once I caught up the group was off again meaning that I did not get any chance to rest. So my advice is that this excursion is fine providing the you have a good level of fitness and are comfortable in the heat. Do lots of research if you are thinking of undertaking this walk in either high or early shoulder season. That said, I am really glad I undertook the walk, it is special and the views are spectacular. This is a must if you are traveling to the Amalfi coast. Neno was absolutely amazing and very informative. The hike is a bit rough sometimes but the walking stick that was provided definitely helped us out. Highly recommend! Wonderful hike with amazing views. Expert, informative guide who set the pace to accommodate everyone. The hike is pretty strenuous - especially in hot weather. Wear appropriate footwear and have fun! This hike was stunning! It was about 4 miles and on the challenging side, but well worth the views! this was an excellent hike that was worth every penny. Our guide was extremely knowledgeable and quite entertaining. I only wish that Viator offered hiking the entire path. I would highly recommend this to anyone traveling to Amalfi Coast. The views are breathtaking, making this an adventure that will never forget. It was breathtaking. Beautiful views, High bluffs overlooking the Mediterranean Sea, amazing. However, people should definitely wear hiking boots and have a walking stick. There are places where there is no railing and 1000 foot drops. You need to be prepared, this hike is not lightweight. You will be scaling up and down rocks, boulders, loose gravel, and high inclines. But worth it indeed. Our tour leader was very helpful and let us borrow his walking sticks.